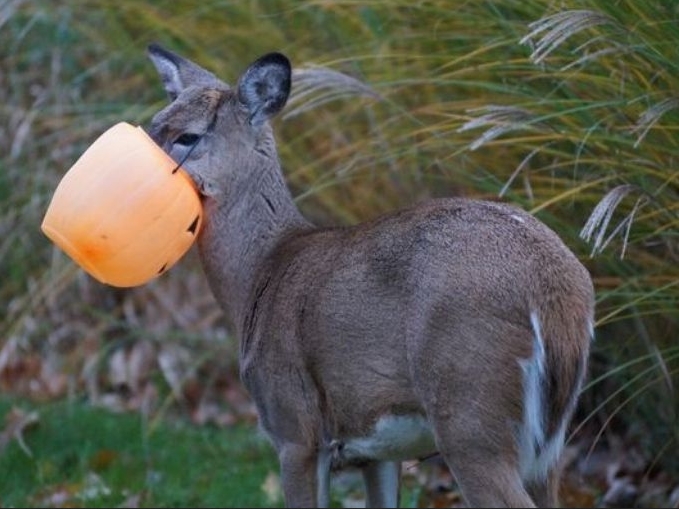 Animal officials helped rescue a deer on Monday that had a Halloween pumpkin bucket stuck on its head. The animal first became trapped over the weekend. Monday, the Ohio Department of Natural Resources called in specialists to help free the deer. The plastic bucket was preventing the animal from eating and drinking. Officials say they don’t tranquilize free-ranging animals and their goal was to remove the plastic pumpkin with non-lethal means. Volunteers from various counties were called in and tried to use a net to capture the deer. Eventually, one of the specialists was able to tackle the deer to the ground and remove the plastic bucket. The man did twist his ankle in the rescue, but will otherwise be okay. Responses to "Video: Deer freed from plastic pumpkin bucket stuck on head"